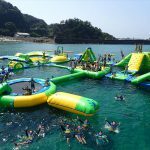 New tourist train Ametsuchi started the service July 1st,2018. This train consists of 2 cars and can accommodate up to 59 people. It operates between Tottori station and Izumoshi station one round trip per day mostly Saturdays, Sundays and Mondays. 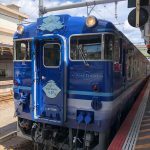 The train leave Tottori station at 9am and return trip departure from Izumoshi station is 1:41pm. 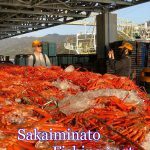 Tourists can enjoy beautiful view of San'in region such as Sea of Japan, Mt Daisen and Lake Shinjiko. The train runs at 80kph but it slows down at 25-45kph while it is passing scenic areas. Ametsuchi named after the first sentence of Kojiki(Records of Ancient Matters). Its interior features traditional crafts from San'in region like washi(Japanes papers),Sekishu tile and Yumihama kasuri cotton texistile. 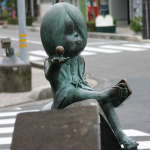 Shigeru Mizuki, the manga artist of Gegege-no-Kitaro, was born and raised in Sakaiminato city, Tottori Prefecture. Mizuki Shigeru road which named after him is streching out 800 meters long from Sakaiminatio station. Koi-Yamagata Station is a railway station on the Chizu Express Line in Chizu-cho Yazu district, Tottori open in 1994. This station is one of only four stations with Koi(Love) in its name in Japan. 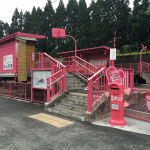 This unmanned station got renovated and transformed into the new appearance in bright pink as you see. 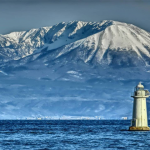 Mt Daisen is the highest mountain in Chugoku region. 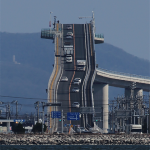 It is 1,711 meters high. 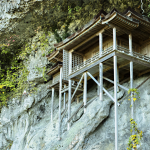 Mt Daisen is also designated as Daisen-Oki National park(3rd oldest National Park in Japan). This mountain is known as the largest beech forest in the western Japan. 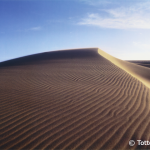 Tottori Sand Dunes are the largest Sand Dunes in Japan located in the corner of San'in Kaigan UNESCO Global Geo Park. It stretches 16 kilometer long from east to west. The wave patterns on the surface formed by wind is beautiful and it is the one of the best highlight of Tottori Sand Dunes.